Bonds as an investment have been deemed safe by many investors and financial advisors. This has caused many people to forget after their nearly four-decade run that bonds have a very ugly side that can yield great pain. The yield curve inverted last week moving many investors to start the countdown to the next recession and causing bond yields to fall as more money shifted in their direction seeking shelter from what investors feel may be a coming storm. With CPI inflation falling here and in Europe we are seeing central bank liquidity continue to rotate out of risk assets into what many people see as the last game in town which is government bonds. Today's lower yields may be part of a greater conundrum created by the reality of too much freshly printed money floating around and people needing someplace to stash it. An influx of foreign capital and a strong dollar are also contributing to these lower yields. Investors look for large markets to park their money because they imply a degree of liquidity that insures a quick exit if necessary. The sharp move lower in yields has resulted in the first inversion in the recession signaling 3M-10Y curve since 2007. Normally this would be an indication many investor's expected inflation to remain below 2% for decades. Whether this is a true reflection of what investors truly believe this is up for debate because this could also be driven by the search for a safe place to store wealth before a crash. It has been several years since we have seen so many predictions of interest rates remaining low forever and a day. Currently, it appears the whole world is again trapped in an easy money low-interest rate environment with no way out. This is a sign that in the future a massive problem is developing which holds huge economic ramifications and a great deal of risk. 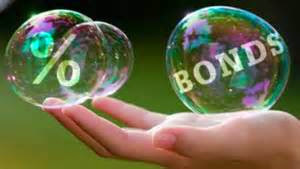 Many of us think the bond market remains a bubble and when it pops it will leave a massive path of destruction in its wake, yet it is clear the general public is totally unaware of the ramifications it will have, these even extend down to reduced payouts on pensions. Many of us have a problem lending hard earned money out for a long period of time and with good reason. Rates are based on predictions of future government deficits and events around the world that may or may not unfold as expected. It is not reassuring to know these forecasts are often formed and made on assumptions based on rosy scenarios or politically skewed to benefit those in power. 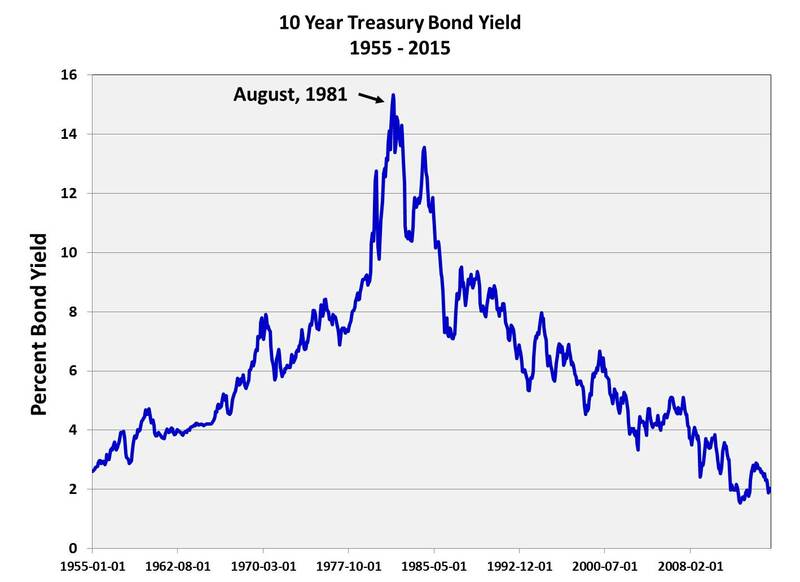 Knowing of the effect that interest rates have on the value of bonds in the secondary markets, one might deduce that the nearly 40-year bull run on bonds will end the moment rates clearly signal they are about to rise. To give you a sense of what this may mean to U.S. Treasury Bond investors a 10-year treasury bond issued at a 2.82% interest rate could see a 42% loss in value from a mere 3% rise in interest rates. This means if you’d held $100,000 in these bonds prior to the rise in rates, you would only be able to sell those bonds for $58,000 in the secondary market after the 3% rise. Please note the $58,000 you get back would be before factoring in the loss of purchasing value lost from inflation. Much of the massive debt hanging above our heads in 2008 has not receded or gone away. In fact, global debt has surged since 2008, to levels that should frighten any sane investor because debt has always had consequences. Because central banks across the world have acted in unison each stepping up time and time again to carry things to the next level does not change the economic reality that this situation is unsustainable. They have merely transferred this debt to the public sector where they feel it is more benign. With a series of off-book and backdoor transactions, those in charge have transferred the burden of loss from the banks onto the shoulders of the people. This should give us little comfort, shifting the liability from one sector to another does not alleviate the problem. In this case, bonds are generally the place where the risk has been transferred and history has shown the promise of payment in the future is often broken. In light of rapidly growing global debt, it might soon become apparent that storing your wealth in any kind of "paper promise" is a bad idea. This means, far more concern should be focused on what happens if this is indeed a bubble market and it pops. The idea of money quickly leaving the bond market should worry to all governments. Bonds are not just issued by America but by countries all around the world. While some forecasters predict America is now set to grow at the fastest pace in a decade debt investors are signaling their skepticism as slowdowns in Europe and Asia threaten the U.S. economy. The term "liquidity trap" often used by Allen Greenspan and others can be difficult to understand. It can occur when all the additional money poured into the system, even when coupled with lower rates, can no longer drive the economy forward. This could happen if people realize the return on loaning money is simply not worth the risk! Why do you want to loan money if may never be repaid or repaid with something that is totally worthless? When this happens the only safe place to store wealth is in "tangible assets" and lenders will start loaning money only for short periods at super high rates. This will signal that we are at the end game, the collapse of the economic efficiency of credit has powerful implications because credit is the lubricant that greases the wheels of commerce. Consider the possibility that inflation has been kept in check primarily because we as a society have invested a large percentage of our wealth into intangible products such as stocks, bonds, and even currencies. If faith drops in intangible "promises" and wealth suddenly flows into tangible goods seeking a safe haven inflation would soar and this would drive interest rates upward. Like many of those who study the economy I worry about the massive number of promised being made and the debt being accumulated by governments, this all ties into the pace at which central banks have expanded the money supply. The current subsidizing of the auto, housing, and financial industry with an ad hoc disregard for basic economics produces a very flawed kind of growth. For years the ECB has manipulated bond rates lower for countries undeserving of such, as a result, Italy, and others have kept their debt service cost in check, but the fact is artificial rates from central banks mask and perpetuate a debt problem that will come back to haunt them. The idea that markets are always efficient is a myth manufactured by so-called experts residing in the ivory towers of academia. Disconnected from the real world those responsible for guiding our banking institutions often fail to see potential second and third order effects of debt monetization. This poses a great threat to the stability of our economic system. A policy of blindly trusting anyone who claims to be an expert has disaster written all over it. If the bond market is indeed a bubble the implications of its collapse will be massive and such an event will not only affect bondholders but will test the economic foundations of both the country and the world. Not only will bondholders be stripped of wealth but soaring interest rates will magnify the nations debt service and rapidly impact our deficit in a negative way. Ironically, the Wall Street Journal reports that nearly bankrupt Illinois and its biggest city Chicago just kicked off a move to borrow hundreds of millions of dollars. This will test investors’ willingness to lend to stressed governments prone to spending more money than they bring in. The fact is when governments default the pain goes everywhere and a dagger slips into the hearts of bondholders who receive nothing or little of their investment back. Whenever I start to think this long credit cycle and massive expansion of debt will never end I slap myself and force myself to remember that periods of rapid credit expansion always end the same way and that is in default. It should never be forgotten that debts can go unpaid and promises broken, the impression that many people hold, "things are different this time" will surely be tested. As the next chapter unfolds in America's financial future those rushing to buy bonds may someday rue the day they made this decision. Footnote; Below are two prior posts. 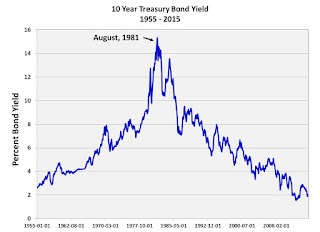 One concerning how in 1980 the Fed turned bonds on their ear by raising rates to 20% if you have the time it takes you down an interesting path explaining how we got to where we are today. The other argues much of this debt will end in default as history shows it always does. As usual please feel free to explore the blog archives and as always your comments are encouraged. A good essay. This analysis, plus the "unsteady" state of world economics makes me feel like a piece of space fluff circling a large black hole.